Breakfast is one of my favorite meals of the day. Maybe because I usually wake up hungry and immediately search for something in the fridge, or maybe because it seems you can eat almost anything for breakfast (from last night’s leftovers to fluffy warm pancakes), but regardless, breakfast is a moment, however long, before the day to be present and fuel your body. There are, more often that not, many mornings where even opening your fridge seems like too much of a waste of time — that the morning will have to suffice without a bite to eat. This breakfast I’m making today is not for one of those mornings. This dish is one to enjoy, bite by bite. This, is my Spiced Pistachio Cream Chia Pudding. 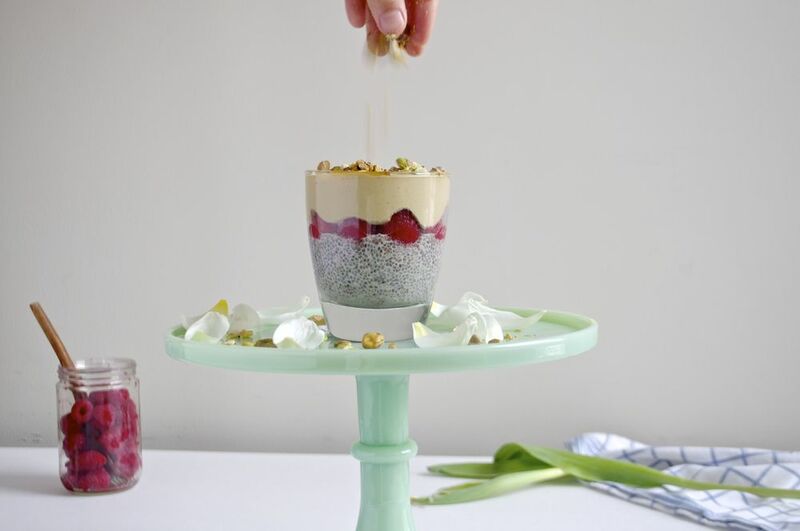 I’ve made a chia pudding before on the blog. It was a green smoothie chia pudding. Today, it’s all about pistachios and making the most wonderful, light, healthy, and flavorful mouse-like cream that is the perfect topping for a chia pudding. So what is chia pudding? It’s typically a vegan "pudding" made from chia seeds that are soaked in a liquid like nut milk or coconut milk for a few hours. The seeds swell and form a gel-like exterior, creating a ‘pudding’ like consistency. The seeds add a crunchy texture and can be flavored to your liking. I usually add some vanilla extract or vanilla bean and little agave or maple syrup to sweeten, other times I don’t add anything. It’s really up to you! Chia seeds are considered a superfood for they are packed with omega-3 fatty acids (a great source for vegetarians! ), fiber and magnesium; and their ability to expand will help you feel full during digestion. I usually make my chia pudding the night before, so it allows the seeds time to really absorb all the liquid, but more so, because I will have breakfast waiting for me in the fridge. And today, this is one of my favorite chia puddings I’ve made. This Pistachio Cream Chia Pudding sounds difficult to make, but it’s really not. All you need is some time (preferable make it the night before) and a powerful blender. And trust me when I tell you the time is worth it. I was so happy with how the pistachio cream turned out. My idea for a vegan pistachio cream came from something my mom would always have around which was, Crema di Pistacchio, a sweet Sicilian pistachio cream. It’s a rich and decadent, sweet and nutty. Its texture is almost like a paste and it tastes very much like a pistachio-flavored white chocolate. The ingredients usually include pistachios, sugar, and oils. I've also seen versions with cocoa butter, hence the white chocolate taste. It’s so good, I can usually polish off a jar quite quickly. That’s why, when I was coming up with this recipe, I wanted to make a healthier version. My adaption includes almond milk, agave, spices, and of course, pistachios. The result is a light and airy mousse that’s filled with aromatic and decadent flavors. To make the pistachio cream all you need is a high power blender. Soak the pistachios in some water for a few hours, that way they are easier to blend, and will make for a smoother and richer consistency. I add the pistachios to a blender along with a little almond milk (note: the amount will depend on your blender and how long you’ve soaked the pistachios), agave, vanilla extract, nutmeg and ginger. The nutmeg adds earthiness and warmth, which compliments the pistachios. The ginger, because if you haven’t gotten to know me over the past few months, is one of my favorite flavors. It adds tanginess and heat. It opens up other flavors and brightens a dish. To really get the full flavor of the mousse, it’s best to let it rest in the fridge for a few hours, or better yet, overnight. Like when making homemade almond milk, allowing the mixture to sit will really help the flavors settle and come together (especially when you’re not cooking the ingredients, allowing them to rest and marinate helps enhance the taste). The result is a rich but light cream. The pistachios provide a richness and nuttiness, but it’s not overpowering, because soaking the nuts and blending all the ingredients together helps create a light airiness. There are mornings I grab the quickest thing I can find in the fridge, but other mornings, when I have time, I love indulging in a slow breakfast. One that tastes great and is ready for you right when you wake up. This recipe is perfect for lazy mornings, or making it the night before in a jar and having it on the go the next morning. I love making it on a Sunday evening, so I can start my Mondays with a delicious and healthy breakfast. Because the pistachio cream is so rich and flavorful, it’s a dish upon itself. You can just make just the pistachio cream and it would be great for dessert if you’re having friends or family over or for a decadent snack -- you will savor each bite. I hope you all enjoy this recipe as much as I do! For those with allergies, this recipe is vegan, gluten free, dairy free, and raw. Happy Eating! To make the chia pudding: In a bowl or jar, stir together the almond milk, chia seeds, vanilla extract and agave. Place in the fridge for at least 4-6 hours or overnight. To make the pistachio cream: Soak the pistachios in water for 4-6 hours or overnight. Drain and rinse. In a high-power blender, place the pistachios, almond milk, juice of 1 lime, agave, vanilla extract, nutmeg, ground ginger, and salt. Note: the amount of almond milk you use will depend on how long you soak the pistachios and your blender. You can also add some water too instead of milk, it’s up to you! Place in a container or on top of the chia pudding, once it's ready, and let it chill in the fridge for at least few hours before serving, or overnight for best results. This will really help allow the flavors to settle and enhance. Serve chilled and enjoy!